2NE1 is one of my favorite Korean pop groups and I've always had a soft spot for Dara so I'm totally flattered to have people think we look alike! Most times when people tell me I look like someone I don't see it but for Dara I can somewhat see the resemblance as with Narsha from Brown Eyed Girls. What do you think? Do we look alike? Some screencaps I took. Love her rainbow shadow!! My best Dara impressions. She does lots of silly faces! Let me know what you think in the comments!! What should I do for my next "inspired" look? Wow you really do look alike! I'm excited to see the tutorial but I can't cuz I'm at work with no speakers. Hehe. :} I REALLY like your falsies! Wow your dupe is even better than the original! Those lashes are awesome and I love the last pic!! Wow, you guys look really similar! wow you guys are so alike.. esp with this makeup look on. Lips eyes brows n everything.. even nose. beautiful!!!! Whoa...you really nailed this look. I think it looks better on you than Sandara! omgawd!!! yall definitely look alike! Jen! Aw you did such an awesome job! I love 2NE1 and Dara is one of my fave girls out of that group. That music video is also one of my faves. When it first came out, my friend and I couldn't stop admiring their make up! Especially their eye makeup! It's just toooo pretty! And I think you did a great job. The bangs looked super difficult to do. I think you're right, Dara must have had something rolled up in her bangs or they were fake bangs lol for them to be THAT perfectly rolled lol! One of my friend's went to YG Entertainment building to deliver stuff to 2NE1 today (: haha I was so excited, and wished that I was still in Korea so that I could go with my friend Lol. that is such a fun and cute look. Love it! and yes, you do look alike. Beautiful as always! man, i want to know her skincare secret because she looks like a kid there and she's suppose to be older than you. so jealous. Camilla: She's only older than me by 1 month. lol. wow you did an awesome job on that look! you look exactly like her :) great job! and love your lashes!!! [X] You DO look like Sandara! [X] You both are soooooo prettyyyyy! [X] Your skin is flawless. [X] I think you're a bit prettier than Sandara but you both are GORGEOUS! [X] You should be Sandara's stand in and be part of 2NE1 when she isn't available for appearances. [X] You are talented. You have mad artistic skills with make-up and with everything you do! [ ] You are a pretty pink pony in another life I've decided. You guys look really alike! I shall wear this look for my receptionist job tomorrow. WOW!! Your makeup and hair is DEAD ON! You did such an amazing job Jen! I like your look better than hers. I think it's something to do with the lashes. STUNNING!! I don't know what other look I'd want to see but I know I'll love whatever it is you do. I enjoy all your videos. wow i tot the right side photo was YOU! look so ALIKE, JEN! NICE! i've never commented before but just had to this time! In your opinion, do you prefer Skin79 Hot Pink BB Cream or the Lioele Beyond Solution BB Cream ? Awesome! Definitely resemble each other especially in the first photo :) Only diff is she looks cheekier haha, good one Jen! You are just soo incredibly amazing and talented, Jen!! Lol I agree with Kassia's checklist 100% You look STUNNING and you definitely really nailed this look to the POINT!! I think you guys look SOO similar!! Except your nose is slimmer and "taller" than hers. I think you're prettier and cuter just because I somewhat know you "personally" (thanks to the good old Internet) and I don't know her at all--I just know of her since she is a celeb! hehe I always enjoy all of your videos! LOVE watching every one of them!! 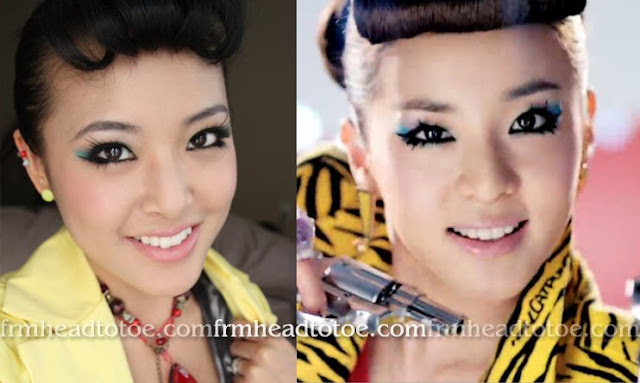 wow you look amazing and you really do look like DARA!!! Lol...you are so cute!!! Yes, definitely lookalike. Sure you two are not related? I haven't commented in a while, but I just had to with this post!! Great job & loved watching the tutorial. omggg i loooove this tutorial! and you do look alike.. crazy~ but seriously, i love your inspired tuts... you're awesome jen :)! hahaha you're adorable!! <3 this. and the "dara" hae yo <- too funny. I was so excited when I saw this tutorial in my blog feed! 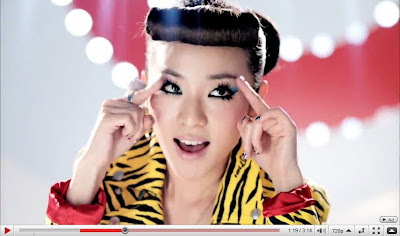 I LOVE 2NE1 - Fire is one of my favourite songs and I love that song they did with Big Bang, Lollipop :P Great tutorial! this is my favorite look you have done so far. i just loved everything! the makeup. the clothes. the hair. everything! you did such an awesome job! WOW! There is definitely a similarity, but great job! It looks amazing. Do a Popteen model look! Someone like Tsubasa Masuwaka or Kumiko Funayama ! loving the tut but its definitely not something i'd wear on a everyday basis! You both look like identical twins! It's crazy! Really nice! Thanks again for anothe great tutorial :D I'm also very interested in skin79 BB cream. Are you going to do a review on it? Because I think Lioele is too light for my skin tone, so I was wondering what your thoughts were on skin79. Stunning! You two looks the same, but i agree that you're more gorgeous.. I've been itching to try a makeup with "rainbow colors" since the time i watched alice in the wonderland.. Love how the color are combined... So this is posted on the right timing. Stunning lookalike! Beautifully done =) Esp the hair!! 'cept prettier of course. heh. The rainbow shadow is soo pretty. Never knew the combination of those colors could look so stunning. I have a dress in the torquoise color and I should try this do! Thanks so much for this tutorial! I loved this tutorial. So fun!! It's crazy...you two look so much alike!! :) Great tutorial Jen! You really pulled off the look. I googled Narsha of Brown Eyed Girls..i got to say..she works a better doppleganger of you rather than Dara. just check out this pic..
You should deinitely try something from the new Final Fantasy game, big in Japan. also, you two do look alike! You look so gorgeous! The look is so good on you! You make it look wearable! haha, I'd love to see a BoA inspired look sometime! AWESOME job!!! i love your blog and tutorials!! I thinkkk you should experiment WAY OUT for your next tutorial and do a Japanese popteen girl look. Buy a blonde wig and do the falsies! It'll be tough to pull off but it'd be great to experiment just to see, and for fun! Oh my gosh! You made yourself look just like Dara! So pretty... did you not use eyelid tape? Amazing! wow you really look like her! Pretty look! She's my second fav after CL <3 You do look like her! Oh wow, you did an amazing job, Jenn! Your makeup skills are just gorgeous, and you are super photogenic! When I first started watching you on YouTube, I immediately thought you look a lot like Dara. There are similarities between the two of you. Wonderful job you've done. Love the tutorial! You look like dara.! You look better than dara !! You should do a SNSD look for your next tutorial! May I suggest Sooyoung or Yuri? My two favorites! uh, are you sure you're not secretly an asian star pretending to be an every day blogger? haha you look so alike, great look! I actually like ur look way better, esp the lashes. loved the tutorial! could you please do one on Hyunain her music video change? SNSD look next please! Genie or Run Devil Run. Are you guys separated at birth? You look so much alike! I so love the eye makeup, it's beautiful! oooh you look like her with the backlit photos! U both are really like twins! !